The Anasazi pottery seen here has been dated between 1000 and 1300 C.E. In Renaissance times, Europeans were not the only ones accomplishing great things. No one can deny the beauty of Michelangelo's brushwork or the brilliance of Shakespeare's verse. But societies elsewhere also flourished. As the modern world turned 1600, it seems as though each corner of the globe had its own "renaissance." The Native American societies of North America were no different. They had diverse cultures and languages, much like Europe. When the British staked their claim to the east coast of the modern United States, they could not have dreamed of the complexity of the peoples they were soon to encounter. 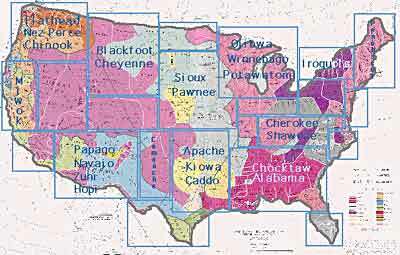 There are between 140 and 160 different American Indian tribes. There is no single Native American language. It would be as difficult for the Mohawk Indians of the East to converse with Zuni Indians of the West as it would be for Germans to converse with Turks. Before Europeans arrived in North America, Native peoples inhabited every region. This map shows Native American tribes, culture areas, and linguistic stocks. Twenty-seven states derive names from Indian languages. Native Americans turned wild plants such as corn, potatoes, pumpkin, yams, and lima beans into farm crops for human consumption. More than half of modern American farm products were grown by Native Americans before British colonization. Medicine was not an unknown science in the Western Hemisphere. Most natural herbs used for medicinal purposes in the modern world had also been used by Native Americans before European contact. Archaeologists have learned that North American Indians made salt by evaporation and mined a great many minerals including copper, lead, and coal. Despite myths to the contrary, not all Native Americans were peaceful. Like Europe, the American continent faced tribal warfare that sometimes led to human and cultural destruction. The buffalo played an important role in the survival of Native American tribes. In addition to providing food, the buffalo provided clothing and more. In short, there is no simple way to tell the tale of a continent that had been peopled by diverse communities for thousands of years. Their tales are as complex as any others, their cultures as rich, their knowledge as deep. British contact did not mark the replacement of established cultures by a better way of life, but rather the beginning of a new civilization based on a blend of diverse folkways. An examination of three groups — Anasazi, Iroquois, and Algonkian — serves as a beginning to learning about the American world that once was. How did European explorers respond to the language, clothing, customs, dwellings, and food of the Native American peoples? How did the Native Americans respond to the language, clothing, and customs of the explorers? What are some of the difficulties in trying to understand someone from a different culture? Why was it difficult for European explorers of the 15th and 16th centuries to understand the diversity of the native peoples who lived in the Americas? How do historians and archaeologists know what the explorers experienced? How do they know what the Native American peoples experienced? 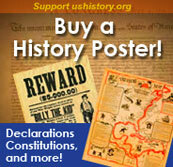 What do you want to know about the Americas prior to the era of European exploration? How can you find out?